Los Angeles, CA – All over the city, animal welfare agencies and organizations are sounding the alarm: the kittens are coming. They’re coming in litters, as singletons, with and without mamas. But, back in March at the spcaLA South Bay Pet Adoption Center in Hawthorne, an unweaned 2 week-old kitten arrived in a startling and heartbreaking way – left abandoned outside in the shelter’s mailbox. Mailbox kitty at 4 and 6 weeks. “Abandoning an animal is a crime and very cruel,” said spcaLA President, Madeline Bernstein. “The kitten could have easily died inside the mailbox.” Luckily, a shelter staff member heard mewing and searched for the source, which led her outside of the building and into the mailbox. It was touch and go at first, but Mailbox Kitty, or Brett, received immediate veterinary care. He was fostered by an spcaLA volunteer who bottle-fed and cared for him. Today, he is available for adoption. 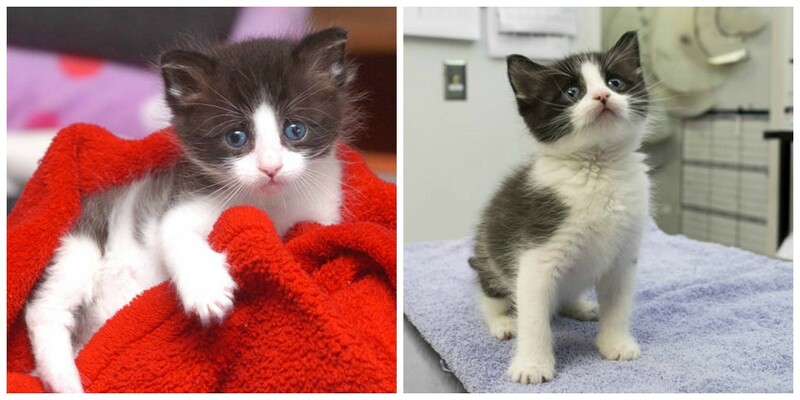 spcaLA needs help to make sure more kittens have a happy ending like Brett. spcaLA’s “Kitten Shower” is a donation drive to raise monies, needed items, adopters, and foster volunteers. People who want to help can donate funds online or bring items, like kitten food, milk replacer, small litter boxes, and non-clumping litter to any spcaLA location. For more information about donating, becoming a foster volunteer, or adoption locations, please visit spcaLA.com.